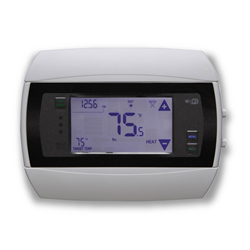 The Radio Thermostat CT50-WIFI is a 7 day programmable thermostat with built-in WiFi module allowing for local and Internet control, scheduling and status using an iOs or Android smartphone or web browser and the free cloud service. No setup or monthly fees! Save money and energy by keeping the heat/cool at an energy saving level when you're away and adjusting it to a comfortable level remotely when you're on the way home, to the office, or the cottage. 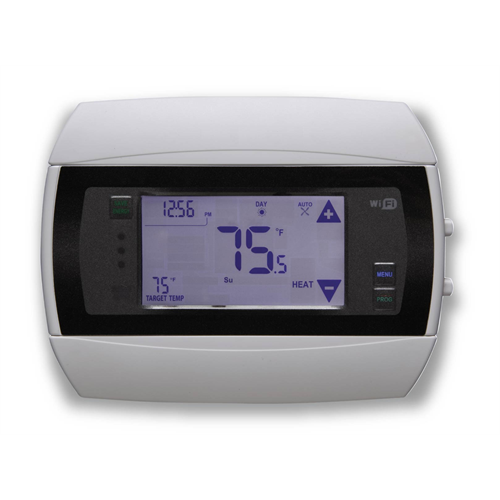 The free Internet portal and iPhone/Android app allows the thermostat to be remotely set to Heat, Cool, or OFF modes, allows the fan to be switched from OFF to Auto and allows complete configuration of the 7 day scheduling separately for both heating and cooling modes. It can even integrate with supported home automation software and controllers. For those who prefer to 'roll your own' code, the CT50WIFI has an open API for direct control! REQUIRES common/power wire or optional 24VAC power supply. See below for options if you do not have enough connections.